This is a delicious soup recipe to make on the Caliber Indoor Pro Rangetop during the fall season. 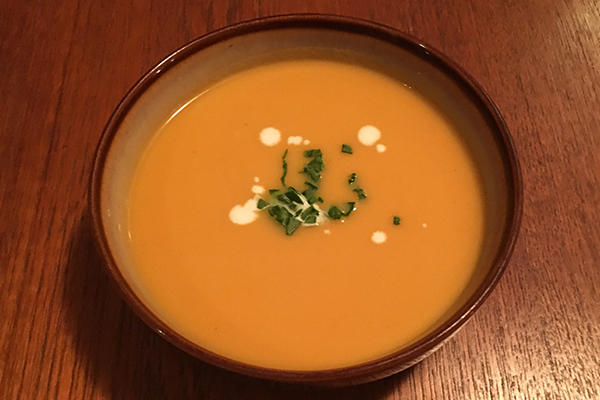 Sweet potato is the secret ingredient, which adds an extra sweetness and texture to the soup. Peel, seed and dice the squash. Peel, seed, and dice the sweet potato. Put them both in a pot with the vegetable broth, water, and salt. Bring the pot to a simmer for 40 minutes, or until tender. Be careful not to boil. While the vegetables simmer, melt the butter in a pan. Gently cook the onions in the butter, stirring occasionally, until they begin to caramelize. Continue cooking for about five minutes, stirring often. Add the wine to the onions, cover, and simmer for 10 minutes. Add the onions to the mixture in the pot and continue to simmer for the remaining time, about 25 minutes. Puree everything with a hand blender. Add the cream, white pepper, and a bit more salt if needed. Garnish with chives or cilantro. Enjoy!